Soybeans, soymeal, corn and wheat traded lower. US stocks traded lower. Crude traded lower. US Dollar was higher. Word that POTUS will not meet with POC before the March 1 trade deadline and that US and China remained far apart in a trade deal weighed on prices. Soybeans traded below initial support near 9.15. This suggest March futures could now test 9.00. Weekly US soybean export sales were near 38 mil bu. Total commit is near 1,138 mil bu vs 1,500 last year. USDA goal is 1,900 vs 2,129 ly. Some estimates are closer to 1,800. Some feel it will be hard for USDA to come up with bullish news tomorrow and another approaching US partial shutdown could hurt US economy. Average trade guess for World 2018/19 soybean carryout is near a record 113 mmt vs 115 in December. Range is 109-115. Key to tomorrow report will be first, USDA estimate of US 2018 soybean crop. 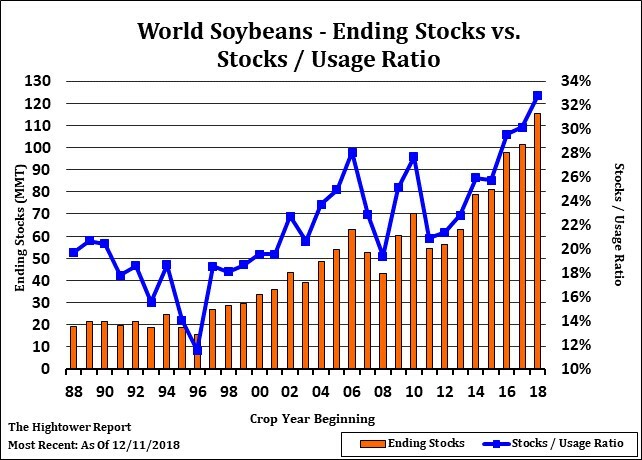 Next will be USDA Feb 1 estimate of Brazil and Argentina 2019 soybean crops. Next will be USDA estimate of China soybean imports. Finally how all of this impacts US and World carryout. Corn futures followed lower soybean, US stocks and lower energy trade. Concern about Europe economy offered early resistance. Fact March corn futures traded back below key moving average also slowed the up momentum and turned momentum lower. Managed funds continue to be net long corn futures. Some feel this due to talk of lower US supply and increase export demand for US corn. Weekly US corn export sales were only near 20 mil total commit is near 1,253 mil bu vs 1,050 last year. USDA goal is 2,450 vs 2,438 ly. USDA will release the Jan 11 Dec 1 stocks, 2018 final crop and US and World Supply and Demand with the Feb 8 report. Average trade guess for World 2018/19 corn carryout is near 307 mmt vs 309 in December. Range is 305-309. 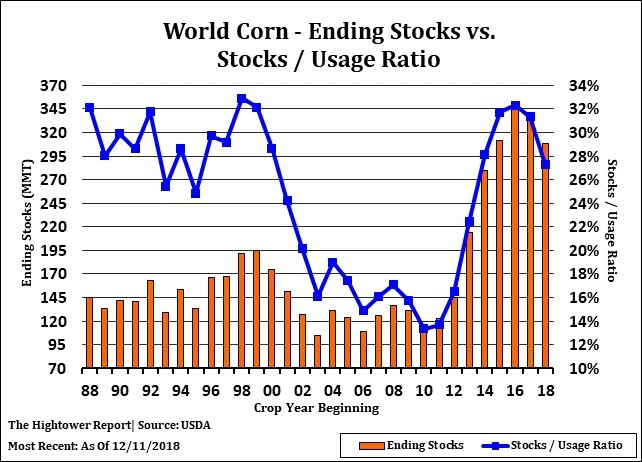 Key for corn is final US 2018 corn crop and US and World corn end stocks. Wheat futures traded lower. Talk of higher than expected EU Wheat exports may have offered support. Concern about slowing World economy could slow food demand may have also weighed on prices. Wheat futures traded back below key moving averages. Most commodity and equity market were lower on talk POTUS may not meet POC before the March 1 trade deadline and that the 2 were still wide apart in negotiating a deal. Weekly US wheat export sales were near 22 mil bu. Total commit is near 653 mil bu vs 715 last year. USDA goal is 1,000 vs 901 ly. 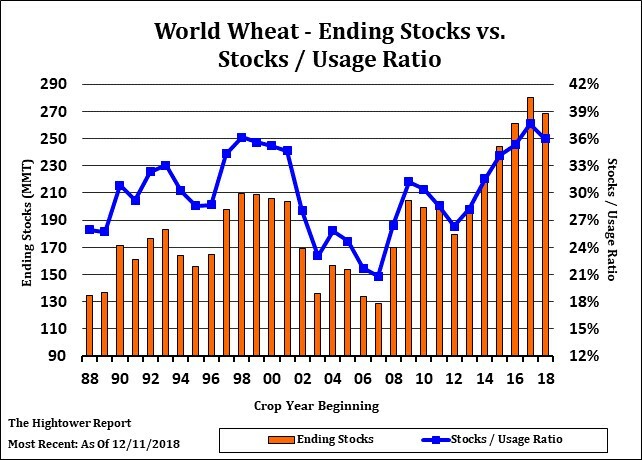 USDA will release the Jan 11 Dec 1 stocks, 2018 final crop and 2019 winter wheat acres along with the Feb 8 report. Average trade guess for World 2018/19 wheat carryout is near the record 268 mmt vs 268 in December. Range is 266-270.